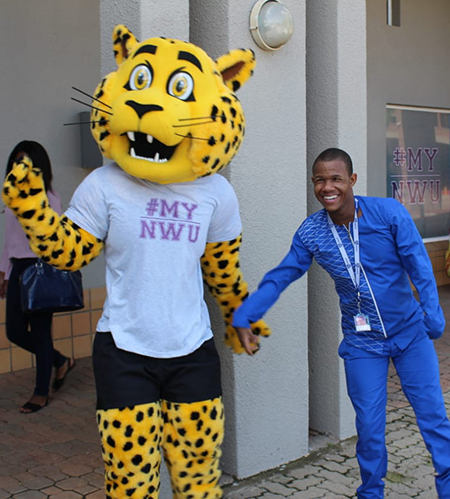 On 19 March 2018 the North-West University’s (NWU’s) campus in Mahikeng unveiled its new secret communication weapon – Mafika the leopard – the new campus mascot. The primary role of this mascot is to serve as a communication medium between students, the Campus Student Council and campus management, as well as improving the NWU’s brand visibility. Mafika the leopard has a dual meaning for the campus in Mahikeng. Not only is Mafika a physical representation of the leopard statue in front of the campus’s Great Hall, but the word Mafika also means ‘a place of rocks’. Mafika has siblings at the other campuses: VUVU from the campus in Vanderbijlpark, and Pukki from our campus in Potchefstroom. Mafika and his siblings will make official appearances at all big university events, irrespective of the campus where the event is taking place. “These mascots represent the NWU community and enhance our student life experience by embracing our core values: ethics in all endeavours, academic integrity, academic freedom and freedom of scientific research, responsibility, accountability, fairness and transparency and embracing diversity,” Jean concluded. Mafika, the mascot of the NWU’s campus in Mahikeng, is spending some quality time with staff. Here he is with Pono Lekone from Admissions.